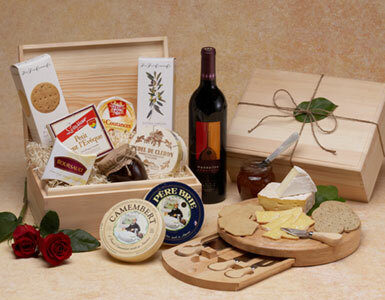 A beautiful wooden box filled with an assortment of six different French cheeses accompanied by crackers and fig spread - a true French experience for $125.00. With cheese board and knife set - $150.00. With wine - add $25.00 more. We specialize in cheese and crackers gift baskets, fine cheese gift baskets, assorted cheese gifs, fine cheese gift basket, and make prompt French cheese basket and gourmet cheese gift delivery in Los Angeles, Beverly Hills, West Hollywood and Santa Monica.